I recently visited Dunn Bros Coffee for the first time to meet up with Ogo Ifelayo, founder of GrubSquad, to do an interview. I’m not a coffee-drinker, but I wanted to try it out anyway. I actually liked it. It was interesting to try a non-Starbucks coffee place. It was spacious on the inside, with couches and high tables with stools for patrons to sit on. It was relatively quiet— quiet enough to study, read a book, or have a meeting without being disturbed. 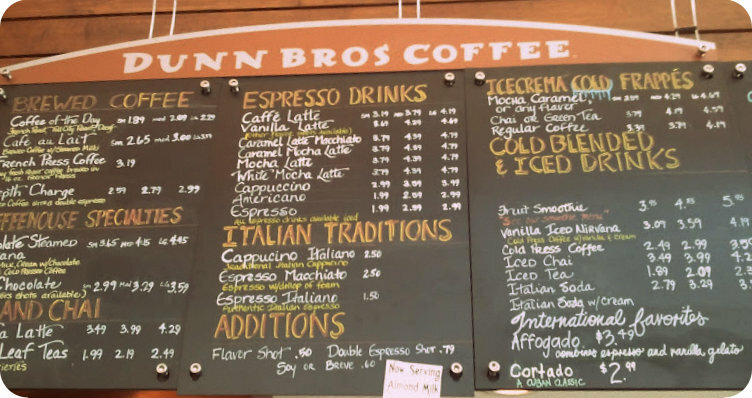 Dunn Bros had a cute chalkboard menu. They served beverages as well as food. The prices were pretty low; most of the beverages were under $5. I ordered a Chicken Pesto pizza (pictured above). I’m a pesto fan! The only thing on it that I had to remove was the artichoke on the top of the pizza. (I forgot to tell them to take it off when I ordered). I’m kinda picky, but I still think the pizza was delicious. I also had a strawberry smoothie (also pictured above). It tasted like fresh strawberries! The only downside was that the cup was on the small-side. I was a little bummed when I finished the smoothie and had no more left. It was a nice, light meal. Good taste. Laid back atmosphere. 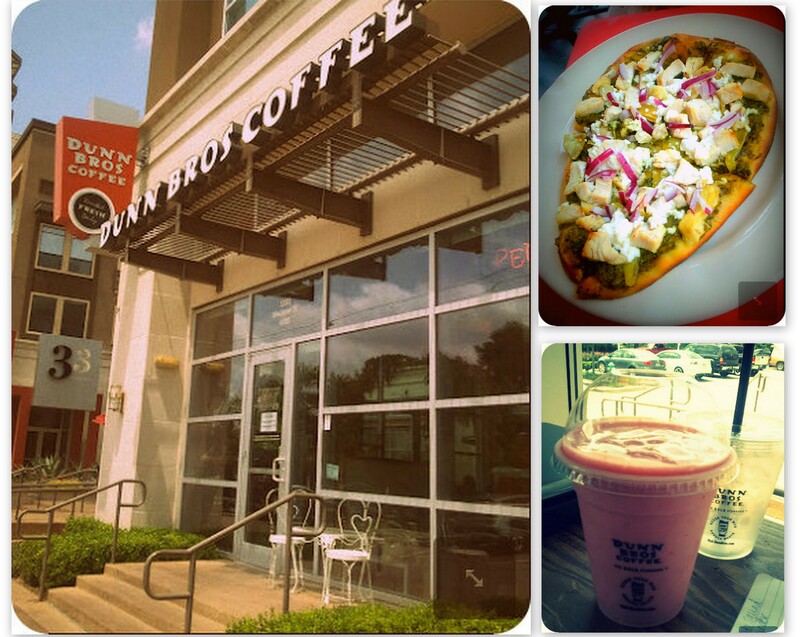 I’d recommend Dunn Bros Coffee if you’re looking for good beverages (coffee/smoothies) and food. Next time, as per the GrubSquad founder’s recommendation, I will try either the Chicken & hummus sandwich or the salmon w/ chunks of mango sandwich. Both sound promising!